We always like to forget that every single gun is an individual, and that no two guns will shoot a given bullet sabot combination exactly alike. A simple sabot change can turn a 6 MOA gun into a 3/4 MOA gun, but usually the changes are a bit more subtle. Only individual trigger time in an individual muzzleloader reveals the best combination--there is no substitute for that. We always try to find shortcuts, but there are really none. 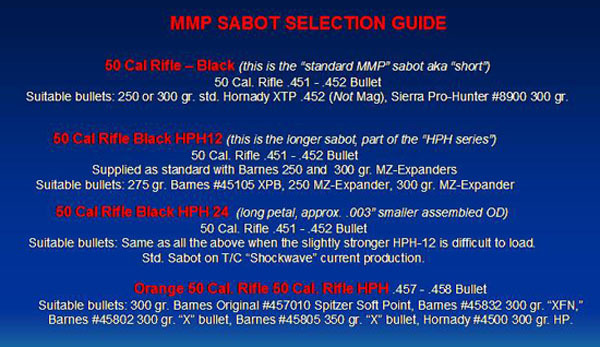 MMP Sabot/Bullet Guide. Courtesy of Randy Wakeman. Many experienced shooters feel that the Barnes MZ-Expanders, by view of their low-velocity expansion, 100% weight retention, and superb penetration are the best terminally performing bullets you can place into a game animal. For game animals inside 200 yards, where most deer are taken (closer to 50 yards in many areas), a test drive with 300 grain Barnes MZ-Expanders will likely get you where you want to be. If they load what you feel is too tightly, the easy solution is HPH-24 sabots from MMP Sabots. You may be "done" right there! For long range work, the Barnes Original .458, 300 grain Spitzer Soft Point flies very flat, and is tough enough for elk, moose, and game heavier than deer, although it has certainly taken a lot of deer as well. You'll need to get the MMP orange sabots, as these bullets are supplied sans sabots. The 250 and 290 grain Barnes TMZ bullets with supplied yellow boat-tail sabots offer "MZ-Expander" quality terminal ballistics in a more streamlined, flatter-shooting package. The Barnes 275 grain XPB #45105, when paired with the MMP HPH-12 sabots, is one of the easiest loading combinations on the market. This all-copper bullet offers a great compromise of trajectory, moderate recoil, and lower velocity expansion than the "X" rifle bullets and Barnes Originals, but not as low a velocity expansion threshold as the MZ-Expanders and the new TMZ's. The better or "best" bullet depends on your hunting style, your personal hunting ranges, and is dictated by your unique rifle. There is no "right" or "wrong" in any of this, of course, but listening to what your own muzzleloading rifle prefers to be fed is never a bad idea.